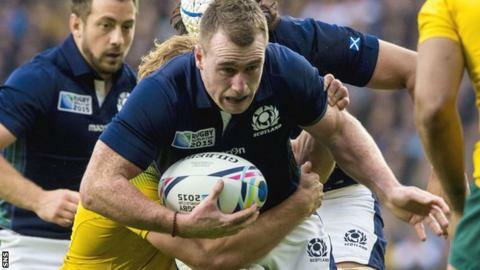 Scotland full-back Stuart Hogg says memories of their controversial World Cup exit to Australia are still raw as they prepare for the Six Nations. Vern Cotter names his squad for the Championship on Tuesday, three months after a 35-34 quarter-final defeat. Referee Craig Joubert awarded the Wallabies a late penalty that replays suggested was an incorrect decision. "You feel you're over it and then you see something and it brings it all back," Hogg told BBC Scotland. "I was watching something on the TV a couple of weeks ago about the legacy of the World Cup and when us going out came up, it just brought back horrible memories. It was bitterly disappointing." Hogg is set to be included in a squad missing the injured Harlequins wing Tim Visser - ruled out of at least the first two games - and flanker Alasdair Strokosch, who retired from Test rugby after the World Cup. Another injury concern is Glasgow centre Mark Bennett, who was due to see a specialist on Monday to determine whether he needs an operation on his injured shoulder. The involvement of Warriors pair Ryan Wilson and Tim Swinson could hinge on the outcome of disciplinary proceedings against them following the European Champions Cup loss at Northampton. But club-mate and fellow midfielder Alex Dunbar could return to the Scotland fold after missing the World Cup with the after-effects of a knee injury sustained in training during last year's Six Nations. After the Calcutta Cup opener against England at Murrayfield on 6 February, Scotland travel to Cardiff - one of three away fixtures in this year's campaign - to face Wales in their second match a week later. Hogg says the squad will be desperate to banish the memories of not only their World Cup despair, but the embarrassment of a Six Nations whitewash last year. "It is another challenge for us now, but we can take immense confidence from the World Cup," said the 23-year-old, who has only tasted victory in three of his 19 Six Nations matches since his 2012 debut. "If I'm fortunate enough to be picked, hopefully we can produce something special in this Six Nations. England first up at Murrayfield is exactly what you want and it would be great to be part of that. "Getting a good couple of wins early doors would give us immense confidence going forward, and we'd be in the tournament if that happens. "We have let ourselves down in the last couple of Six Nations but we are looking forward to it." Hogg and his Glasgow team-mates will be hoping that joining up with Scotland provides a catalyst for rediscovering their World Cup form. Four successive defeats since Christmas have seen them slip to eighth in the Pro 12 table and effectively exit the European Champions Cup, after a third pool defeat on Sunday to Northampton. "Our target was to become the number one team in Europe and we've fallen short again," Hogg noted. "It's fine and well having good performances here and there but it's wins that we need. Europe is the be-all and end-all of club rugby so we're bitterly disappointed to no longer be part of it." After their final Champions Cup game against pool leaders Racing 92 at Kilmarnock's Rugby Park on Saturday, Glasgow - eight points off the Pro 12 play-off positions, but with two games in hand - must turn their attention to restoring last season's lustre. "We're defending champions although to be honest we have not been playing like it lately," Hogg added. "For us it's a challenge to get back up to where we belong."